Craig Alan Johnson, 51, of Cicero, IN, and formerly of Ogallala, passed away January 20, 2018 at his Cicero residence. He was born December 8, 1966 in Ogallala, to John Herbert and Janet Louise (Grubaugh) Johnson. Craig was the youngest of three children. 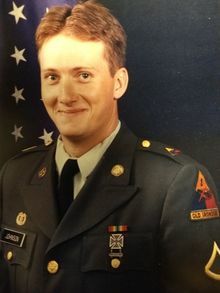 After graduating from Ogallala High School Craig honorably served his country in the U.S. Army. He saw active duty in Desert Storm earning three bronze stars among several other awards. He worked for several years as a semi driver transporting commodities across the United States. He was currently working at a manufacturing facility in Westfield, IN. Craig was preceded in death by his parents, his brother Douglas Johnson, paternal grandparents; Herbert and Grace Johnson and maternal grandparents; Henry and Nadine Grubaugh. Survivors include his sister Teresa and husband Randy Carey of Wilcox, Nebr. nephews; Brandon Johnson of Loveland, Colo. and John and wife Alyssa Carey of Hildreth, Nebr., two niece; Leslie and husband Ben Hinrichsen of Kearney, Nebr. and Jessica Isabell of North Platte, Nebr., many cousins and friends. Memorial service will be Saturday March 3, 2018 at 10:30am in the Draucker Funeral Home with Pastor Craig Cedar of Wilcox Community Church officiating. Online condolences may be sent to drauckerfuneralhome.com where the service will be live streamed for those unable to attend. Inurnment will be in the Ogallala Cemetery with military honors by the Keith County Veterans Organization. Draucker Funeral Home of Ogallala, Nebr. has been entrusted with arrangements. Add Photos, Videos, Music that tell the story of Craig's life.